Welcome to the Industrial Alchemy webserver. Recent updates are listed below. * LEDs and Solid State Indicators: A large and unusual Monsanto MV4H LED, quite possibly the first attempt at producing a high power LED device. * Clocks and Timers: An ornate Yale Triple L time lock, a complicated mechanical device designed to protect a bank vault from Victorian-era enemies. * Transistors and Diodes: A gold plated Teledyne TR1002 Fetron , a solid state tube replacement sold as a part replacement for a number of Heathkit kits. 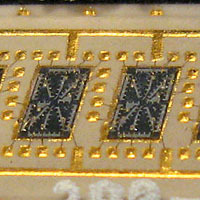 * Integrated Circuits: An IDT 7M912, a large ceramic SRAM integrated circuit that is thoroughly encrusted with smaller surface mount components. The world of electron tube collecting can be a very strange place, but it can be easy to forget just how strange it can get. We have recently added a totally perplexing glass eye Crookes tube to the Geissler & Gas Discharge Tubes section of the site. This tube is a bizarre mystery, and contains a glass eye mounted in a large envelope filled with what appears to be low pressure argon. 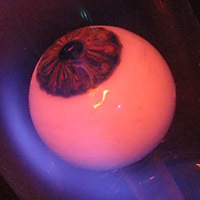 The tube has several electrodes and when energized, the eyeball illuminates with the help of UV-sensitive glass. Even covens of witches can't resist the allure of high voltage gas discharge. Other recent additions to the Technology Museum section of the site include a MG-19B Nixie tube, a 9 segment neon display sold under several different manufacturer's labels. 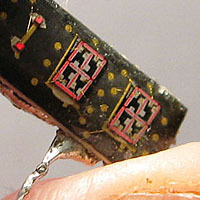 We have also added an unidentified green straight pin LED to the LED Indicators section of the site. 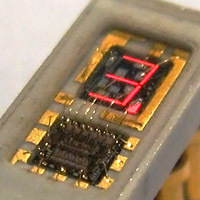 The humble Texas Instruments TIL302 is one of the most common and mundane of early LED displays. With its red epoxy coating and ceramic interior, even novice LED collectors can instantly recognize it on sight. But, as it turns out, the TIL302 is actually surprisingly interesting, and went through a number of dramatic changes over its life. We have added a new article to the Technology Museum covering the TIL302s many variants, including very early clear epoxy development types as well as a glass-packed version for the military. Other new additions include a metal-clad RCA 8072 power tube, which has been added to the Diodes, Triodes, Tetrodes & Pentodes section of the site, as well as an uncommon Intel 1601 PROM which has been added to the Integrated Circuits section. The 1601 was designed as an electronically programmable alternative to Intel's 1301 metal mask ROM, and was released in 1970. In the quest for sunlight readable displays, many manufacturers resorted to extreme measures. A recently added incandescent bargraph module showcases one of the more desperate attempts we have seen by a manufacturer to solve this problem. Rather than settling for dim 1970s-era LEDs, this device uses a fistful of incandescent bulbs mounted in a complex machined aluminum block to produce a display which is readable even when viewed in full sunlight. We do not envy the workers who had to solder the tiny densely packed bulb arrays needed to make this device possible. 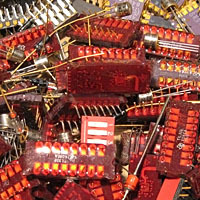 We have also added a new nixie tube, a Burroughs 7153, to the Gas Discharge Displays section of the site, as well as a very rare Intel 1301 mask rom to the Integrated Circuits section. The 1301 was Intel's first mask rom, and was released in 1969. * Incandescent Displays: An obscure Soviet incandescent mosaic display, with a very unusual construction style. * Communication Equipment: An ERO Model 27A cassette recorder, encrusted in more fake gold than an entire silo of costume jewelry. * Diodes and Triodes: A large Amperex 5867 power triode, capable of handling up to 1200 watts. * Gas Discharge Displays: New photos for the Burroughs 7977, a very small top-view Nixie tube equipped with a silicone shade ring. It is often forgotten that a branch of the Nixie tube family tree terminates in a modern day consumer product; the flat panel plasma TV. We have recently acquired a prototype plasma display panel, which has been added to the Gas Discharge Displays section of the site. Plasma display panels are neon filled devices which can display complex graphics and text, and from the 1960s onwards development was pushed by the computer industry, which had desperate need for such a display. The PDP we have added to our collection is small, ugly, and low resolution, but in a world without liquid crystal panels, it was the only game in town. Not all of our new display additions involve plasma. We have also added an AD206B decade counter to the Display & Counting Circuits section of the site. The AD206B makes use of an obscure Pinlite DIP650 incandescent readout for display, and is based around the Texas Instruments 74144 decimal counter IC. 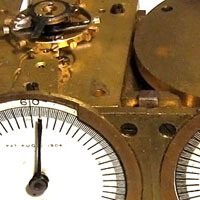 Other recent additions include a 'Star Tracker' astronavigation clock from the cockpit of an American B-52 bomber, which has been added to the Clocks and Timers section of the site. It's that time of year again; Dayton Hamvention 2018 is rapidly approaching, and on May 18th, 19th, and 20th we will be occupying flea market booth numbers 9440, 9441 and 9442. We will have an assortment of vintage electronics and components available, as well as a vast sea of bulky electronics boat anchors best left to the imagination. Those unfortunate souls who have never attended Dayton Hamvention can experience equal portions of envy and lust by viewing Hamvention flea market photos of years past. Not all of our news is related to Hamvention. We have also added several new items to our Technology Museum, including a large EMI 9536 10 stage photomultiplier and a rare Toyo Musen 1D-E14 tuning eye tube, intended for use in Japanese battery powered radios. 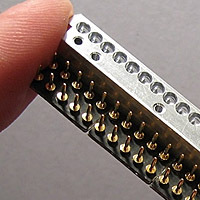 * Solid State Displays: The Soviet-made 490IP1 LED, an obscure part from the former Soviet Union which might possibly be the smallest intelligent LED display ever produced. * Calculators and Adding Machines: A Craig 4505 horizontal format calculator with a tubular VFD display. * Transistors and Diodes: A large and early Honeywell H10 power transistor in a metal and gold package. * Sold State Displays: New photos for the Litronix DL44M an early 2 digit LED display with ridiculously oversized magnifier lenses. We have added a new item to our long-running Mysterious Artifacts page; a singularly unusual brass timepiece. With two dials, two winding mechanisms, and no makers mark, this bizarre device is a total enigma. Two mechanical counters measure time in six minute intervals, and the timebase can be inserted and removed without any tools. With its heavy brass construction and numerous gears, this strange clockwork could easily pass as dimensional leakage from a much more steampunk universe. Not all of our mysteries go without solution indefinitely however. We have managed to make a definitive identification of one of the other items on our Mysterious Artifacts page, a PPT-1 phototransistor. This was possible by finding an example that was still sealed in its packaging, allowing a conclusive identification to be made. Not every mystery remains unsolved. How complicated can you make a light bulb? If you are building a large outdoor display, the answer is 'pretty insanely complicated'. 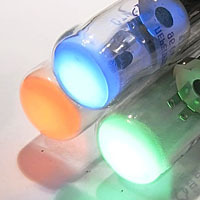 The ILD3 family is a series of cathode ray tubes that require a hardware stores-worth of small parts just to produce a single dot of colored light. 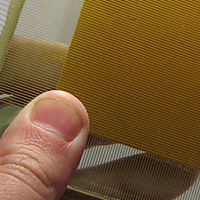 Produced in several different colors, each contains a full CRT electron gun assembly, but no deflection or focusing structures. As it turns out, this is not as preposterous a design decision as one might expect. Not all of our new display additions work in a vacuum. The Beckman SP-450 is a neon filled panaplex display of unusually large dimensions; this late-era gas filled readout can display 32 alphanumeric characters, as well as decimal points and arrows. Other recent additions include an entry covering the CV3615, a small British electrically tunable klystron. The realm of early LED displays is littered with many impractical and perplexing devices. The newly added AEL4004 LED display is just such a device; it is alphanumeric, cripplingly tiny, hard to read, and impossible to use in arrays of more than six characters. A 1970s electronics engineer would have a hard time finding a use case for such a device, especially given it's high cost and expensive manufacturing process. As a result, the AEL4004 was not heavily produced and is now quite rare... it is unlikely this obscure display will see much use in modern homebrew projects. Not all of our new LED additions are rare. We have also added a page for the Hewlett Packard 5082-7300 family of LED displays. 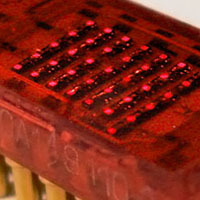 The 5082-7300 was one of the most popular intelligent LED displays ever produced and was produced in many different versions, including gilded military versions like the HDSP-0962. The 5082-7300 is probably best known as the display used in the COSMAC ELF, a popular single board computer from 1976. In the time before transistors, many things we now take for granted were complicated. Calculating a taxi fare was a task requiring hundreds of moving parts and not a single smartphone app, when using a machine like an Ohmer Fare Register. This recent addition to our collection can mechanically integrate time and distance to calculate the fare for a taxi passenger, using a vast collection of cogs and levers to preform the task. The home repairman that tries to dismantle this device for cleaning would likely need seven arms and psychic powers to reassemble it without issue. Not all of our new additions are mechanical. We have also added a Pinlite 430 minitron to Filament Displays section of the site. The Pinlite 430 is noteworthy in that it is one of the smallest minitrons ever made, and is one of only a handful of filament displays with digits smaller than 8mm. Other additions include a new entry and photos for the Sylvania SS-501 argon discharge tube, a large 'U' shaped device intended for use in marine warning strobes. * LED Displays: The Russian-made 3LS340A1, a 5x7 LED matrix with an unusual design twist. 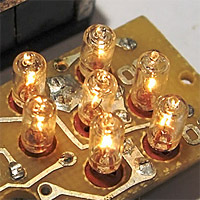 * LED Indicators: A pair of strangely shaped Western Electric 529A & 529B wedge LEDs. * Photocells: A Sylvania P607 UV sensitive photocell tube. * LED Displays: New photos for the Texas Instruments TIL308 including an example that has suffered some, ahem, extreme mechanical trauma. 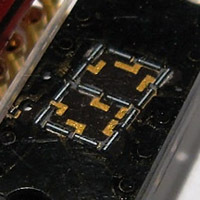 There existed a short time within human history in which 7 segment displays were known to the electronics world, but LEDs were either unavailable or too dim to fill every display need. 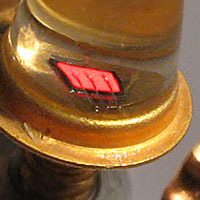 Incandescent display devices like the MSC 24662 and the MSC 901A1B1WC9 were manufactured to fill this gap. These numeric displays make use of small bundles of fiber optics and incandescent bulbs to display numbers. Each differs only in the method of connection; the 901A1B1WC9 makes use of permanently attached flying leads, while the 24662 is fitted with a small edge connector. Other new additions include a Sylvania C2 concentrated arc lamp, and a Wakmann A-11 aircraft clock. 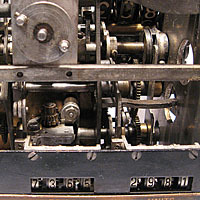 The A-11 example used for the photographs is particularly noteworthy, as it is the difficult to find 24-hour version of this clock. 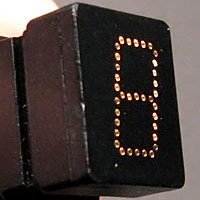 * LED Displays: An impossibly small Surface Mount LED Array intended for use in a 4 digit LED wristwatch. * Trigger Tubes: A somewhat mysterious neon filled TR cell with an unknown part number. * Photocells: The remarkably spartan General Electric 1P24, a photocell which is almost entirely empty space. * Transistors and Diodes: A General Electric 2N188 top hat-style transistor.